The amount of space you have to plant trees and the rootstock you plan to obtain (see below) will determine how many trees you can fit into your space. And then, once this is determined, the type of tree that you should plant will be determined by the environment (including the weather and topography if the trees are to be planted in an area with late frosts), and also the flowering/pollination factors of the chosen trees. 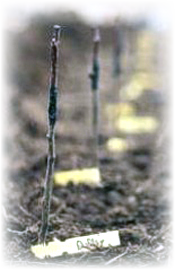 There are several sizes of tree available (rootstocks) in the UK. Please refer to the chart below, which is based upon ‘The Fruit Expert’ (Expert Books), as well as other sources. This will give an idea of the size to expect, and the recommended spacing between trees. However, whatever the recommended spacing, it is wise to plan for possible thinning and tree removal after 10 or 15 years in any case. Trees often do better than expected! Many garden centres (and increasingly supermarkets) are selling fruit trees. Unless the rootstock is specified in these cases, always assume that it is MM106, as this is the most popular type. AndrewLea - In my view if the seller doesn’t know what rootstock the trees are on, you shouldn’t be buying from them! Given the expected lifetime of a tree, there is no point going for second best. A specialist nursery is often better than a garden centre anyway, maybe by mail order. For cider trees this is almost obligatory. Quite simply, different trees flower at different times and, in order to maximise the crop of apples, at least 2 trees that flower at the same time need to be planted within a reasonable distance of each other, so that insects can cross pollinate them easily. Actually, it’s not that straightforward – some trees are self fertile and others (triploids) will not pollinate other trees at all, and require 2 pollination partners themselves. It doesn’t have to be that complicated as a good nursery will know when their varieties flower and be happy to offer advice. However, in the name of good quality information, the Cider Workshop has published a table for as many cider varieties that we can find. Please follow the link below (it will be updated as new information becomes available).